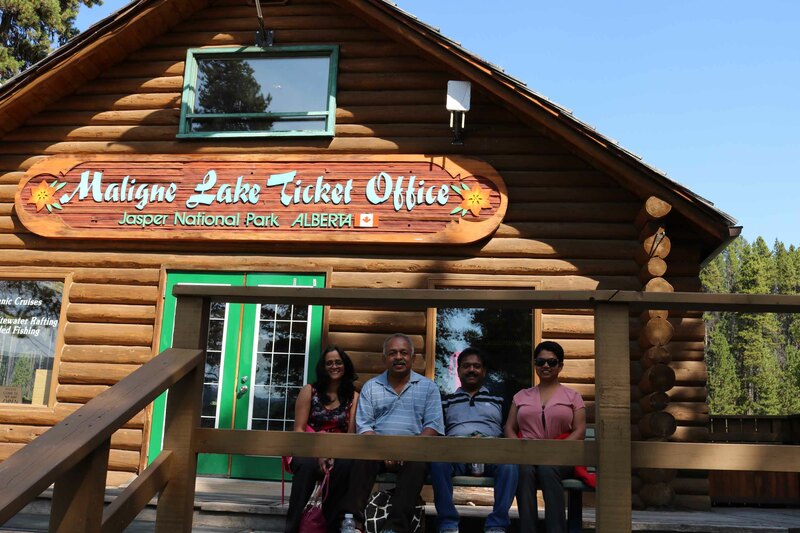 The first place we visited on our tour of the Rocky Mountains in our August 2016 trip was Maligne (loosely translated in French as wicked) Lake and Spirit Island. 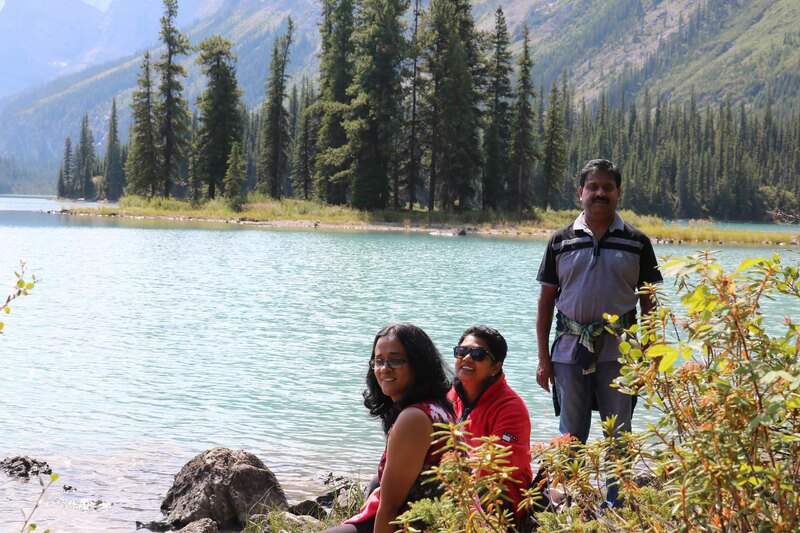 This magnificent lake is located in Jasper National Park, Alberta. The 46 km drive to the lake from the city of Jasper is on a road built along the glacier valley running between the Maligne and Queen Elizabeth mountain ranges. Towering glaciated peaks and turquoise coloured glacier lakes dot the route on the banks of rushing Maligne River. The drive offers plenty of opportunities to spot wildlife such as elk, moose, mountain goats, bighorn sheep, deer and bears. The road ends at a Jasper National Park facility from where the boat cruises for Spirit Island begins. We boarded a cruise boat for a 90-minute boat cruise to Spirit Island. This cruise was, named the “Best Boat Tour in Canada” by Reader’s Digest. The boat was Captained by a young lady and our tour guide, also a young lady, gave us a lot of information about the lake and the surrounding areas as we cruised to the Spirit Island. Maligne Lake, the second largest glacier-fed lake in the world and the largest natural lake in the Canadian Rockies. Ringed by snow and ice-capped mountains, the 22 km long lake stretches past serene Spirit Island up to the melt-water channels of Coronet Glacier. The lake was carved out by glaciers and the lake is fed and drained by the Maligne River, which enters the lake on its South side and drains the lake to the North into the Medicine Lake. An open forest of pine and spruce around the lake is home to moose, caribou and many other species of wildlife. Hiking and cross-country skiing trails abound making this a popular destination throughout the summer. 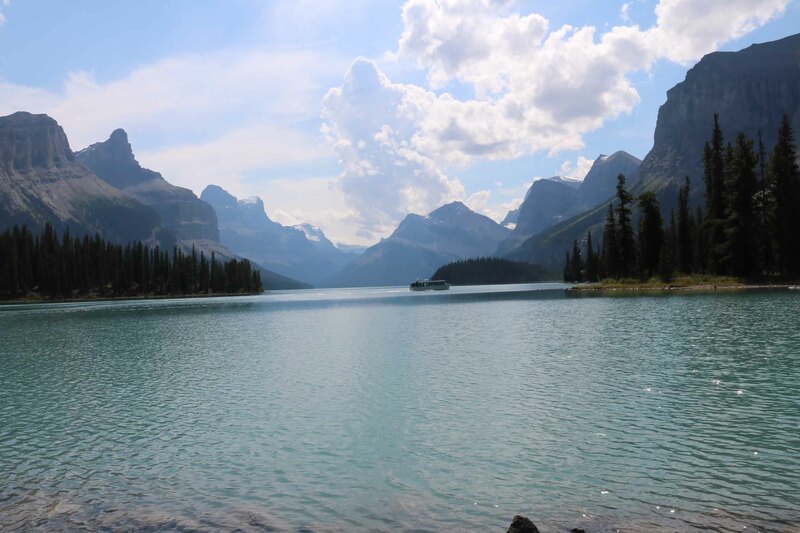 Maligne Lake was originally known as ‘Chaba Imne’ or Beaver Lake by the native tribes who lived near Jasper. In 1907 Mary Schaeffer learned of the mysterious lake and located it. She later wrote about her adventures, making the area a popular tourist attraction in years to come. She first traveled to the Canadian Rockies at the age of 18 with her friend Mary Vaux. Here Mary met Charles Schaffer, a medical doctor who was pursuing his passion for botany. They married a year later and returned to the Rockies each summer until Charles’ death in 1903. The best vantage point from where the lake can be observed with all its beauty has been aptly named as Schaffer’s Lookout after this courageous woman. 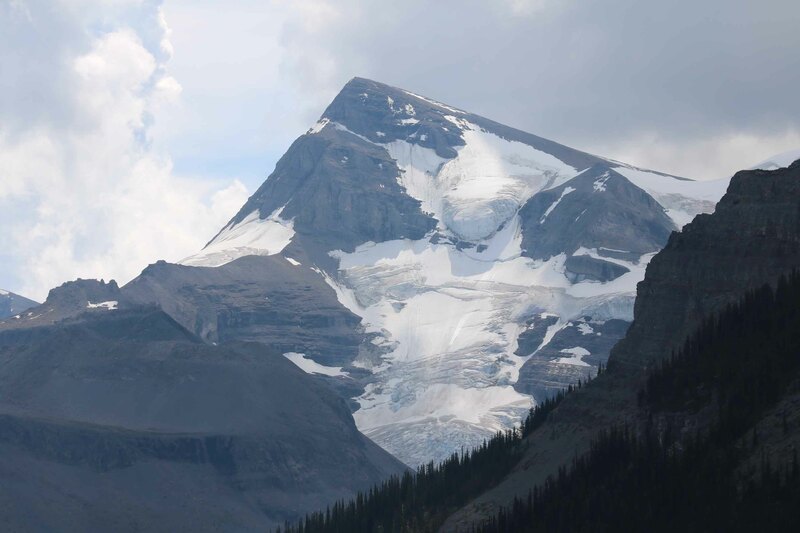 The highest peak in the area is Mount Brazeau (11,386 feet), stands at the South-East of Maligne Lake. The East side of the valley is made of steeply dipping limestone beds which is part of the Queen Elizabeth Ranges, named in 1953 to celebrate the coronation of Queen Elizabeth II as Canada’s sovereign. Queen Elizabeth II became queen upon the death of her father King George VI on February 6, 1952. Over the ensuing days, she received proclamations of allegiance from all of her realms – Canada being the first to do so, beating the United Kingdom by about two hours. During the coronation year in 1953, Canada offered a grand gesture to mark the occasion by naming the mountain range after her. The Queen has till date not set her foot in the area, but the mountain range stands testimony to Canada’s loyalty to the Commonwealth. 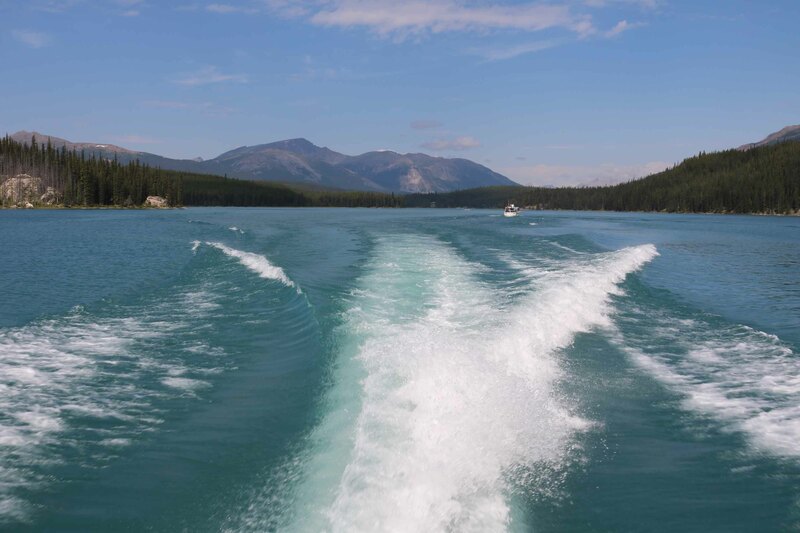 After about 14 km (30 minutes) cruise on the clear turquoise green waters of Maligne Lake, we reached the Spirit Island. One of the most popular pictures in the Canadian Rockies is the image of Spirit Island in the middle of Maligne Lake. There is no road or trail access the island. Tour boats or private, non-motorised craft are the only means of reaching Spirit Island. According to some accounts of First Nations (Aboriginal Canadians) mythology, Spirit Island gets its name from two young lovers from feuding tribes who used to meet secretly on the island. However, when the young woman eventually confessed her affair to her father, one of the tribes’ chiefs, he banned her from ever returning to the island. Heartbroken, her lover continued to return to Spirit Island throughout his life, hoping to meet his lover. She never returned and he eventually died on the island, where his spirit still resides. The aboriginals still hold the island sacred and tourists are not allowed to step on it. The aboriginals offer prayers and conduct rituals on the island. The boat cruised at a pretty good speed, but had to slow down to reduce the wake for the passing canoes. There were many adventurists who on their canoes were making a trip to the Spirit Island. The Jasper National Park facility rents canoes. When a tour boat crossed our boat, the Captain would warn passengers of the following wake. As our boat traversed over this wake, it gave everyone a roller-coaster effect. 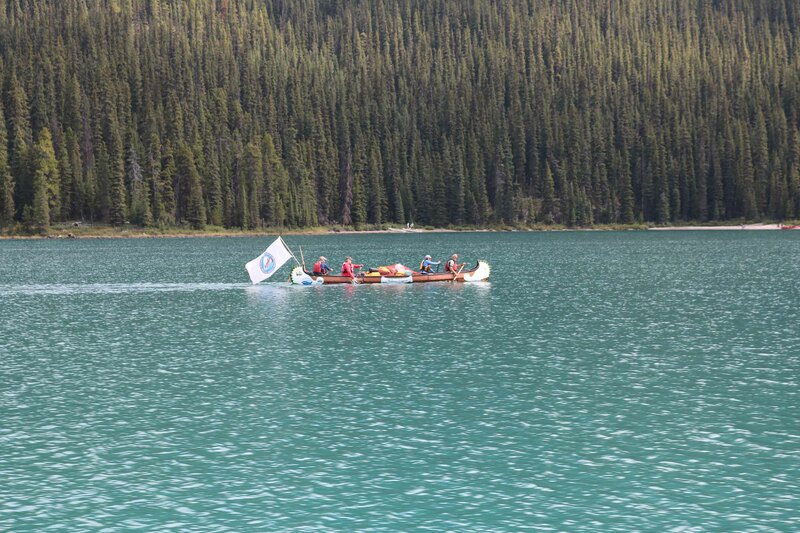 Had the boat not slowed down to a near stop, one can well imagine the plight of those canoes. The lookout over Spirit Island, a small isle of trees linked to the mainland by a low, rocky isthmus, provides one of the most famous sights in the Canadian Rockies—and is surely one of the most recognised mountain scenes in all of Canada. 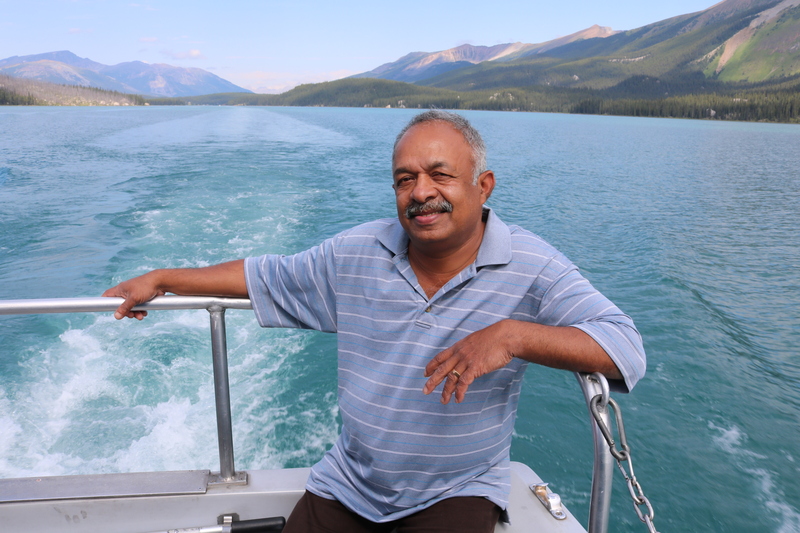 The cruise is a must do for all nature enthusiasts visiting the Rocky Mountains. Woah! I cant wait to visit the Rockies myself!! Never knew that ROCKY can be so beautiful.. only heard about it in the Geography classes in Sainik School!..hope to see it some day, God willing!! Read an Article ” Military Fables of a Democracy” in THE HINDU Newspaper of Oct 12 , written by one Nissim Mannathukkaran. He is Chair at International Development Studies Dalhousie University in CANADA. Very misleading article with total misinformation about Indian Army. I don’t know hoe THE HINDU published such an article. Reji.. do you know this man apparently of Indian origin? Why is he writing such falsehoods about Indian Army? He even claims that the casualties of Indian Army are mostly Jawans !! He does not even know that our office casualties are perhaps the highest in percentage terms. This psedo-intellectual has taken the numbers to reach this conclusion! I think no other country would tolerate such canards. He is safely sitting in Canada and makes such irresponsible statements. Reji.. please read his article and write a rebuttal . You are best placed to do so as you also live in Canada and served the Indian Army with honour.